This vessel is "Tenacity" a private venture boat built by Vosper Thornycroft, Portsmouth in 1969. 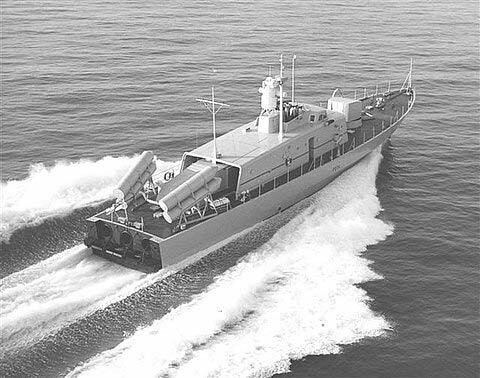 The photo is as completed when she had a dubious mock up gun on the fore-deck and dummy "Sea Killer" missile launchers aft. 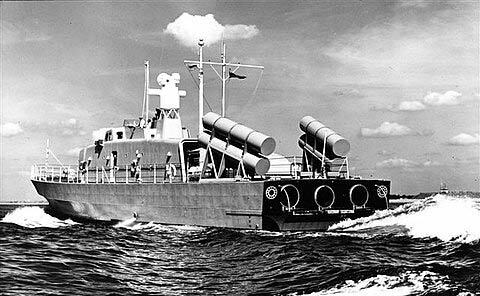 She was looked at by a number of foreign navies but the Royal Navy showed little interest until 1970 when she completed two short charters to them for Nato exercises. She was purchased by the RN in January 1972 and underwent conversion by Vosper Thornycroft, Portchester into a vessel suitable for Fisheries Protection duties. This was completed by March 1973 and she entered service as HMS "Tenacity" P276, without the armament and with a lattice mast. She was 165 tons displacement standard and 220 tons full load. Dimensions were 144=ft x 26=ft x 7>ft. 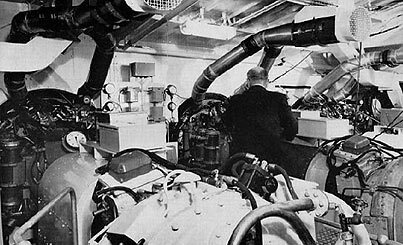 Engines were 3 x Proteus Gas Turbines, triple screw, 12750bhp, 40knots. Also 2 x Paxman Ventura diesels on wing shafts 16 knots cruising. "Tenacity" was sold out of service in 1985. In the early 1990's she was at American Wharf, Southampton without her superstructure. She then moved to Portishead where she was reported,between 1/94 and 8/97, having a yacht superstructure constructed on her. She disappeared by 7/99 and was reported broken up. In Feb 2001, in a compound at Portishead, there could be seen her stem post, keel and bottom plates. It is worthwhile to ponder a little over this quite unique and, by all standards, beautiful craft. These images are from an Official brochure published by Messrs Vosper Thornycroft Ltd kindly forwarded by Les Brown. 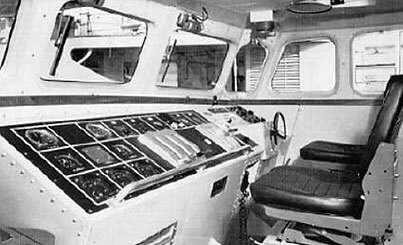 This image is of the Wheelhouse showing the Helm and Engine controls and indicators etc. There was an ‘open’ Bridge from where the vessel would normally be ‘conned’. 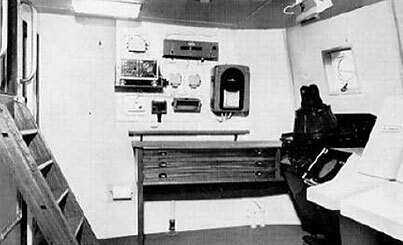 The ‘Operations Room’ (above) situated on the Port side showing the Navigation Table and short ladder to the open Bridge. 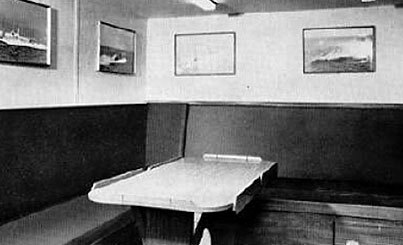 The Wardroom (below) although not fully fitted out, was very sparse by the day’s standards. 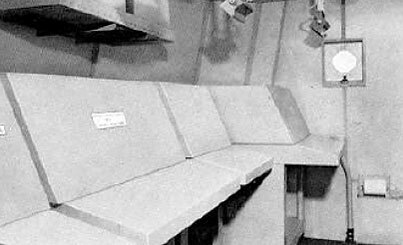 An onboard ‘mock-up’ of the ‘Beam’ riding ‘Sea Killer’ Missile – Fire Control Room. The ‘developing’ American Boeing ‘Harpoon’ Missile being considered as an alternative. 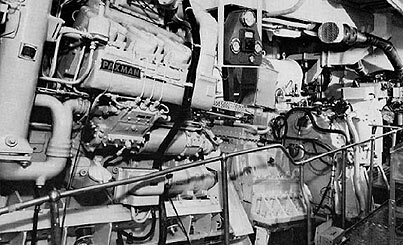 of the Stb’d ‘Proteus’ Gas Turbine Main Engine.